WHSAD Senior Christopher Maldonado was named NY1 Scholar Athlete of the Week for the week of May 20, 2018. 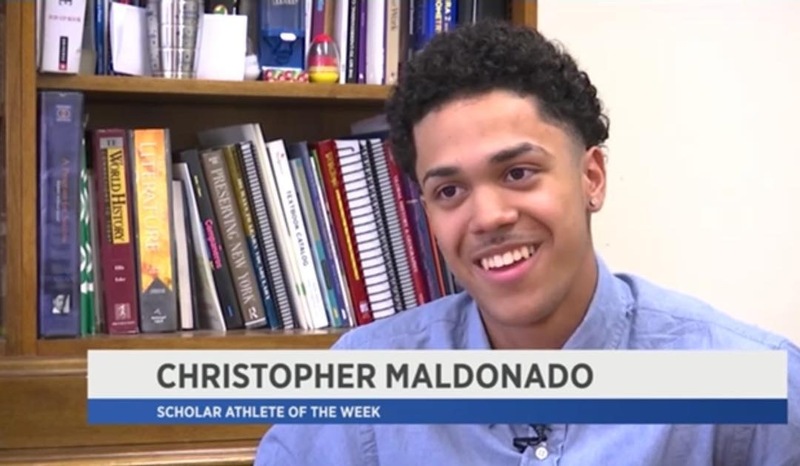 Below, Christopher shares his thoughts as to why he was nominated, and Mr. Rotondi, Christopher’s baseball coach, shares his thoughts as to why he nominated Christopher. Additionally, there is a link to the NY1 feature. I believe I was chosen mostly because I want to make a big impact in my community and based off of my resume I have done that. I have gone to New Orleans and helped the victims recover from Hurricane Katrina. My job there was to help refurbish schools because the paint was chipping off the walls. Basically, I had to beautify the school that was still being heavily impacted by Hurricane Katrina because they didn’t have enough resources. I think that based on my whole resume and what I’ve done to help impact the community in a positive way, I have received that scholarship. I did my work in New Orleans over the last summer. My leadership qualities also played a major role, being a part of the Jeter’s Leaders program. I’ve been placed in leadership roles in which I have to step up and stick up for my peers as well as the community to help better people’s lives. When I found out I was receiving the scholarship, I was filled with gratitude, and it felt like all my hard work has actually paid off and people were actually watching what I do. They always say that the little things count and that goes to show that they really do. People see every little thing and are grateful. They show their gratitude in many kinds of ways. I feel that is important to achieve a higher education after high school because that is basically the deciding factor in who you really are as a person based on your career interest. It goes to show how much work you have to put in and what goes into your whole life and after you’ve finished college. That goes to show that you were here for a reason and that through all the hard work it actually pays off.